Nursery & Toddler Room Reveal! 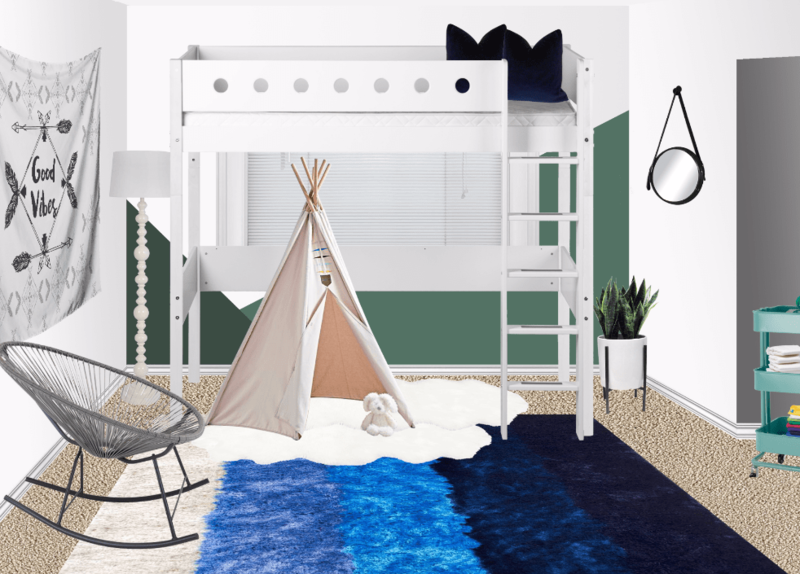 Get all the details on this fun gender neutral kids’ room redo…plus my unsponsored review of an online decorating service! I’ll be honest: home decor is not my strongest suit. I know what I like, and I’m fairly picky at that, but I just can’t seem to recreate what I see on Pinterest in real life! I’ve wanted our home to look put together for years, but since we’re on the track to moving in the next year or so, I’ve sadly stopped putting forth too much effort. However, that doesn’t mean that you can’t go out and get the beautiful rugs and curtains that you’ve been eyeing up for your house. Furthermore, by following a link like https://info.bazaarvelvet.com/rug-quality-guide, you could be able to find a variety of rug types that can slot in perfectly to the decor of your home. That is, until I got pregnant with this baby and we realized that we needed to do some rearranging in order to make this 4 bedroom house fit 10 bodies! The big boys are settled and happy in our basement bedroom, while the 3 big girls share a full-twin bunk bed in their room and Mimi has her own room (perks of being a baby). Poor Finn, however had simply been relegated to a crib mattress on the floor of the girls’ room…but let’s be honest, he ended up in our bed more often than not! I knew that he needed to move in with Mimi, but that it needed to be a special place where he could feel grown up and important. I also began reading reviews of Decorist late last year and thought an online decorating service sounded fantastic, especially if I could snag it on sale. I stalked their site for Black Friday deals and grabbed a room re-do for just $150! That was all the motivation I needed to get started. The pre-design process was very simple and pretty fun! I submitted measurements and pictures of the room, as well as a pinterest board full of ideas. I also included a list of what furnishings I wanted to keep for the room (Mimi’s crib, a light fixture, basket and dresser), and submitted my (very low) budget of $1-2K. My designer, Becky, was super nice, friendly and down to earth and assured me she could totally work with my budget. We discussed how the room needed to be gender neutral and include a set of bunk beds so that Mimi would have a big bed to grow into. She also created a private Pinterest board for us to collaborate on and toss ideas back and forth. That was my favorite part! About 1 week later she came back with the final design, which I again tweaked just a bit. The cool thing is that she sourced and linked to all the products she used in the design, and you can even order the products through Decorist instead of shopping all over the internet, which I did for a few things. As you can see, I ended up doing a few things differently from the final design, due to budget & practicality’s sake, but I absolutely LOVE how it turned out. Finn also loves his new top bunk (complete with Star Wars sheets conveniently hidden under a pretty white comforter) and he and Mimi have been getting along swimmingly in the same room! It makes me SO happy to have at least one room that’s totally done and fun to look at. All in all, I would definitely use Decorist and Becky again, especially at that sale price! Although I probably wouldn’t order directly through Decorist again…I found out the hard way that most items ordered through them are final sale and even if you can return something, you only have 14 days. I didn’t love the colors of the Lulu & Georgia rug in the final design once I got it, but after we got through Christmas and I decided to return, it was too late. Kind of a bummer to get stuck with an expensive rug I didn’t want! *Update: Decorist did end up working with me on returning the rug – but I still think a 2 week return window is crazy short! So, what do you guys think of the final product? Have you ever considered using an online designer? Check out this collection of amazing boy-friendly rooms (including my design) to see more darling ideas! This looks AMAZING! Seriously, when I saw your IG photo, I thought it was a repost from a professional! I love it! So creative and still functional. I didn’t know online decorating was an option. It turned out really great. Thanks Goldie! I didn’t know it was available (and affordable!) either. Definitely won’t be my last time using it!